Check out the final teaser shot of the new 2013 SRT Viper ahead of its debut in New York. SRT has just released the final teaser shot of the new 2013 Viper on their official Facebook page. We have previously seen the Viper&apos;s headlights, interior and vent before so this front-end shot gives us the clearest indication yet as to what the bold snake should look like. The double-bubble roof seen in the teaser photo harkens back to the Vipers of yore and further builds the suspension even further for the model meant to debut in two days&apos; time at the 2012 New York International Auto Show. JonSibal has used the final teaser shot to refine a rendering of the new Viper Roadster and needless to say it looks sharp and aggressive. 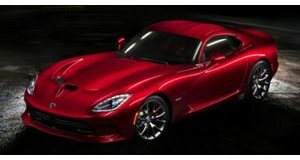 Check out all the teaser shots of the 2013 SRT Viper Coupe and the rendering of the Viper Roadster below.